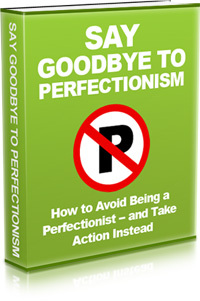 Perfectionism is the belief that perfection can and should be attained. In an extreme form, perfectionism is a belief that work and products that are anything less than perfect are completely unacceptable. That later of which is actually what they call in psychology, a maladaptive belief, and often causes problems in day to day functioning. Many business owners in the world today can be described, and are often self-described, perfectionists. The epidemiology for internet based business owners is not different. Perfectionism can be a driving force for success, but in the fast paced world internet businesses, it is truly a double-edged sword. It can serve to push forward the business, or it can serve to destroy it. The internet based business owner must learn how to weld this weapon well to succeed. The purpose of this article is to encourage all internet based business owners to avoid these maladaptive behaviors and to spend their time in taking action rather than thinking about it.